The PLJV boundary in relation to the short- and mixed-grass prairie Bird Conservation Regions. Who are we? We are a regional partnership of federal and state wildlife agencies, conservation groups and private industry dedicated to conserving bird habitat throughout the western Great Plains — including portions of Colorado, Kansas, Nebraska, New Mexico, Oklahoma and Texas. We provide science-based planning tools, decision support tools and outreach to help habitat managers become more efficient and effective at delivering on-the-ground conservation. Partnerships are the key to PLJV’s success. The PLJV is a partnership organization that facilitates cooperation among a broad coalition of partners on the national, regional, state and local levels to fund and implement habitat conservation. We provide regional planning, value-added efficiency and implementation approaches, while our partners provide financial, technical and local expertise to develop conservation projects. In addition, we support local conservation partnerships, state agencies and other partners by developing various decision support tools, as well as educating them about how to use the tools to target and deliver the most effective habitat conservation. PLJV also works with a variety of partners to inform landowners about conservation programs and to target conservation efforts in areas that will provide the most benefit. In the western Great Plains, private landowners play an important role in bird conservation. Because 97 percent of the land within the PLJV region is privately owned, conservation must happen on private lands. Through enrollment in various Farm Bill programs, such as the Conservation Reserve Program (CRP), landowners help conserve bird populations throughout the region. Native grasslands, wetlands, rivers, and streams provide habitat for a myriad of plants, insects, amphibians and continentally important populations of waterfowl, shorebirds, waterbirds, and many other migratory and resident birds. However, these habitats are becoming increasingly rare in this agriculture-dominated landscape and, consequently, the native wildlife populations that depend on them are also declining. Habitat loss is caused by a number of factors, including conversion of land to agricultural use, habitat fragmentation, overgrazing, municipal and residential development, energy development, filling and pitting of wetlands, damming of rivers and streams, and encroachment of non-native and/or invasive plant species. 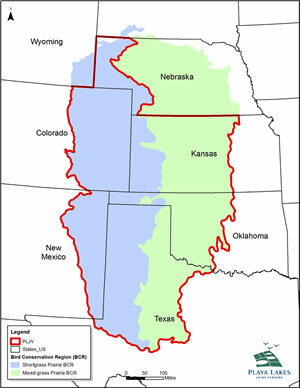 It is estimated that 50 percent of the original High Plains landscape has been altered in some form. Of particular concern is the loss of playa wetlands. Playas are the most numerous and pervasive wetland habitat in the region and therefore critical to wildlife health and survival. They are also a primary source of recharge for the Ogallala Aquifer. The biggest threat to playas is sedimentation. Accelerated sediment accumulation occurs in playas surrounded by cropland when rain or irrigation runoff carries loose soils into the playa basin, gradually filling it. Sediment build up reduces the volume of water playas can hold and increases the rate of evaporation, thus limiting the time a playa holds water. According to researchers, during the past two to three decades, more than half of all playas have been buried by sediment. Birds are an integral part of our environment and are essential for the health and beauty of our world. At Playa Lakes Joint Venture (PLJV), we envision a future when the ecosystems within our region sustain birds and other wildlife in concert with humans and our activities. Our mission is to conserve the playas, prairies and landscapes of the western Great Plains through partnerships for the benefit of birds, other wildlife, and people.